Kit Price (’13) was exploring a local creek on a Geomorphology course field trip north of Wooster led by Dr. Greg Wiles. Like the excellent paleontologist Kit is, her eyes continually searched the pebbles, cobbles, slabs and outcrops for that distinctive outline of something fossilian. This particular place has been in the blog before, so we know the stratigraphic and geological context of the rocks. Kit saw the curious golden brown, rounded rock above and immediately noted the presence of several fossils on its exterior. She collected it, cleaned it up, and the two of us examined the treasures. Here is the key to what we found: A = trilobite pygidium external mold (more on this below); B = productid brachiopod dorsal valve internal mold; C = replaced bivalve shell fragment; D = productid brachiopod ventral valve external mold; E = nautiloid external mold. 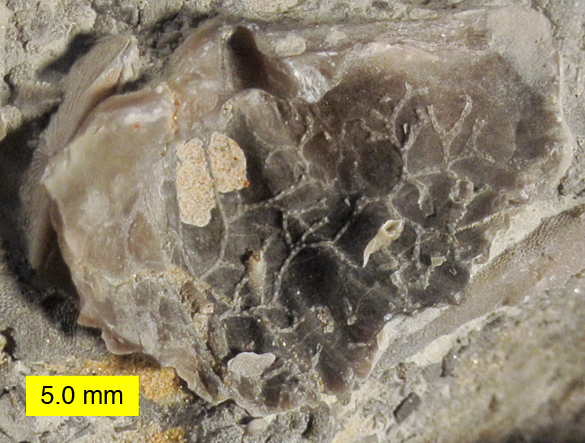 There are also external molds of twiggy bryozoans on the surface, but they are too small to distinguish in this view. 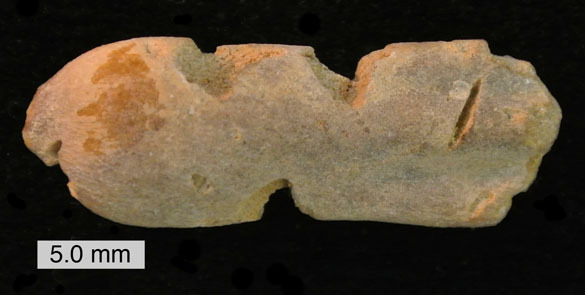 This rock is an ironstone concretion formed within the Meadville Member of the Cuyahoga Formation (Kinderhookian; Lower Carboniferous). It weathered out of the softer shale matrix and lay free on the creek bed. The original shells of the various fossils were dissolved away after burial, either being replaced with iron oxides (like the bivalve) or just remaining as open cavities (the molds). They represent a little survey of some of the animals that lived in this shallow, muddy seaway. Most of these fossils would have been lost to the dissolution, but the hard concretion preserved them. Thanks, Kit, for such a nice view of a local Carboniferous community! 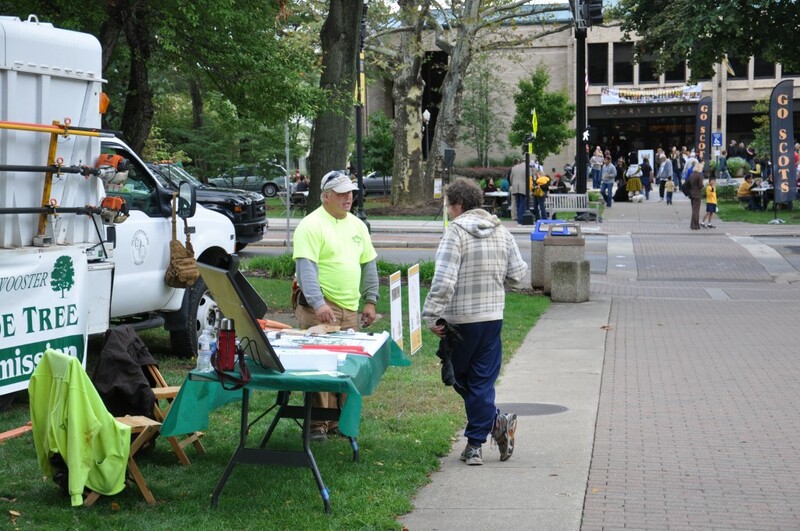 It also brought back fond memories of my own local explorations as a Wooster student long, long ago. Corbett, R.G. and Manner, B.G. 1988. 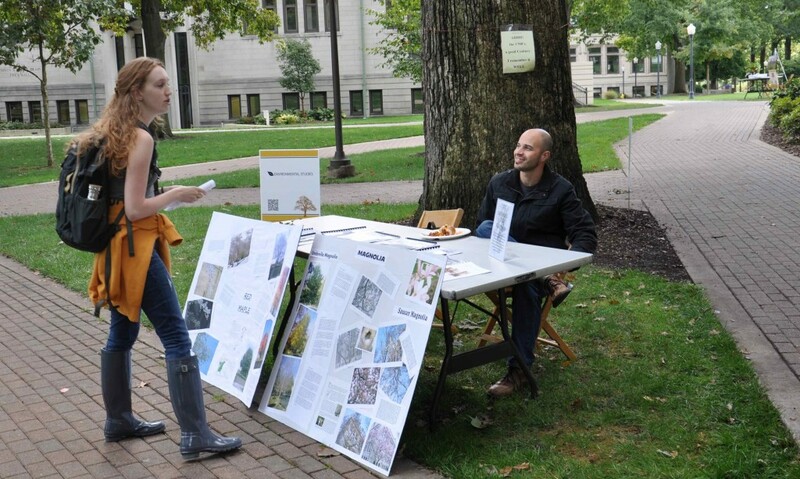 Geology and habitats of the Cuyahoga Valley National Recreation Area, Ohio. 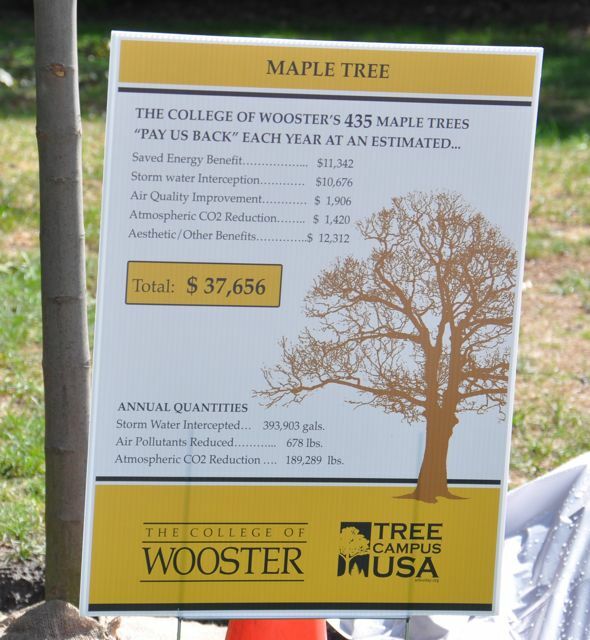 Ohio Journal of Science 88: 40-47. Wilson, M.A. 1979. 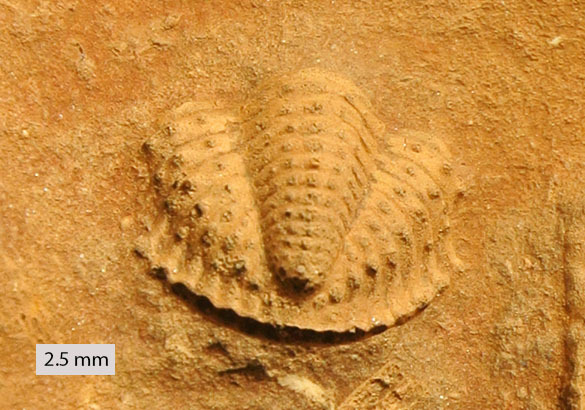 A new species of the trilobite Brachymetopus from the Cuyahoga Formation (Lower Mississippian) of northeastern Ohio. Journal of Paleontology 53: 221-223. WOOSTER, OH – Thanks to our crafty technician, the Wooster Geology Department is now the proud owner of an earthquake machine. The design comes from IRIS as a way to demonstrate Elastic Rebound Theory, the idea that stress accumulates on a fault until it slips, releasing the stress and causing an earthquake. A view down the length of the earthquake machine. The machine is relatively simple. It consists of a wooden block covered in sandpaper sitting on a sandpaper-covered track. 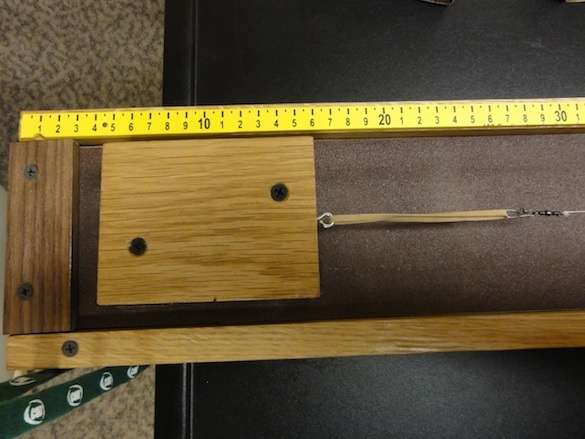 The wooden block is attached to a rubber band, which is joined to a string on the other side. The crank at the end winds the string around the threaded rod, pulling the wooden block along the track. 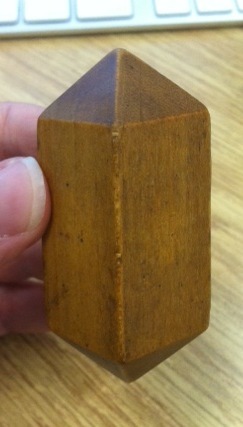 A close-up view of the rubber band that joins the wooden block to the string. In the experiment, a person turns the crank at a constant rate. 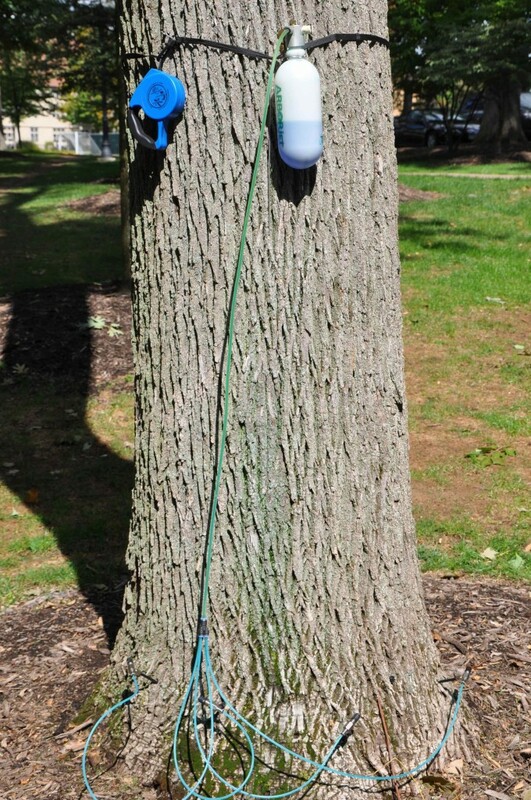 The string pulls on the block, but the block doesn’t move. Initially, the rubber band stretches to accommodate the stress. Eventually, the stress overcomes the frictional force holding the wooden block in place. The wooden block jumps forward along the track and the rubber band returns to its original length. 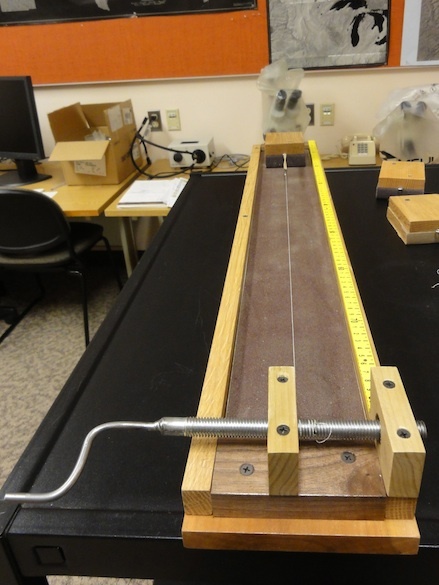 The stick-slip motion of the wooden block simulates the stick-slip motion of faults. The brave volunteers who operated the earthquake machine and generated our first dataset. After some practice and coordinated teamwork, we generated about 35 slip events. We recorded the position of the block after each event and the amount of time between events. It took about 20 minutes of class time, 8 volunteers, and 3 trial runs. Although the model is relatively simple, the data are not. We’re using the data to ask sophisticated questions about earthquakes: What is the relationship between earthquake size and the amount of time between events? How predictable are earthquakes? What size earthquakes are most common? How do our results compare to the public perception of earthquakes? Eventually, we’ll compare our model to real earthquake data and case studies. 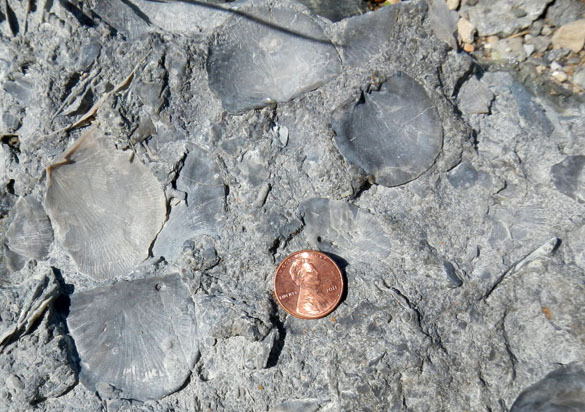 Kevin Silver (’13), a sharp-eyed paleontology student, found this odd brachiopod on our field trip earlier this month in southeastern Indiana. It comes from the Upper Ordovician (Katian) Whitewater Formation. 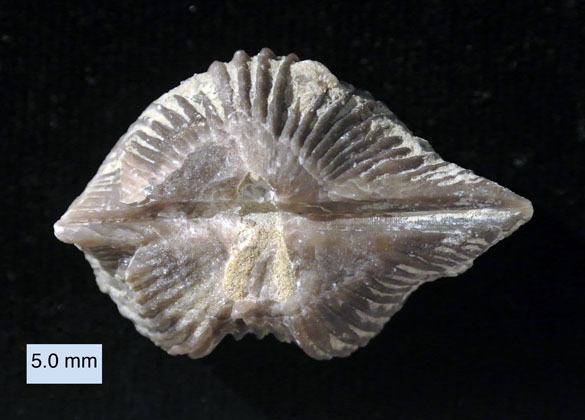 Kevin correctly identified it as Vinlandostrophia acutilirata (Conrad, 1842), an orthid brachiopod formerly in the genus Platystrophia (see Zuykov and Harper, 2007). The above view is looking at the anterior of the brachiopod with the dorsal valve above and the ventral valve below. 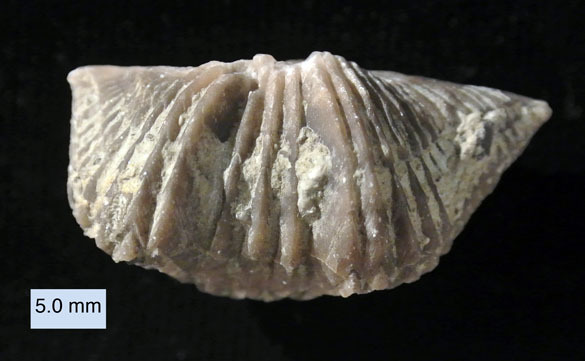 What we see right away is that this brachiopod specimen is asymmetric: the right side is much shorter than the left. This is a feature of this individual, not the species. Is it a teratology — a deformity of growth? Probably. 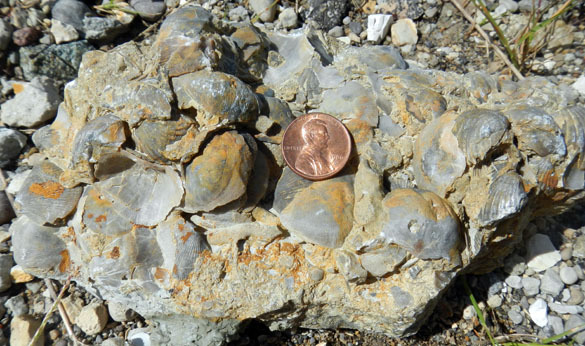 It is unlikely to be from post-depositional squeezing because the shell is otherwise in excellent shape. The oddity did not seem to hinder this individual from growing to a full adult size. 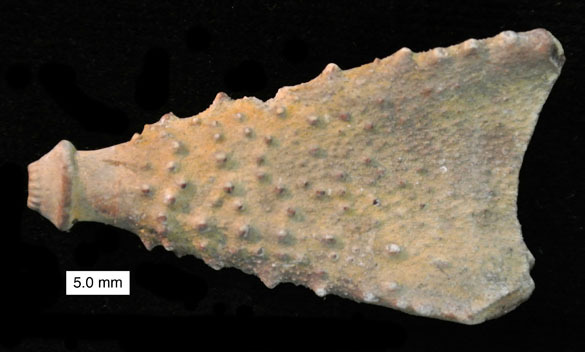 The same specimen looking at the dorsal valve with the hinge at the top of the image. The fold in the center is coming up towards us. The posterior of our specimen, with the dorsal valve at the top. This is the hinge of the brachiopod. A view of the ventral valve with the sulcus in the center. Alberstadt, L.P. 1979. 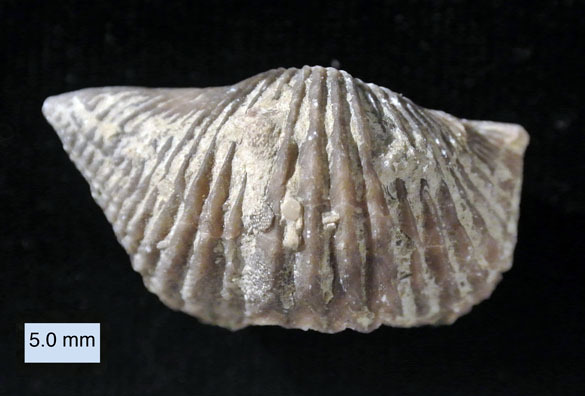 The brachiopod genus Platystrophia. United States Geological Survey Professional Paper 1066-B: 1-20. Boucot A.J. and Sun, Y.L. 1998. Teratology, possible pathologic conditions in fossil articulate brachiopods: p. 506-513, Collected works of the international symposium on Geological Sciences, Peking. Conrad, T.A. 1842. Observations on the Silurian and Devonian Systems of the United States, with descriptions of new organic remains. Journal of the Academy of Natural Sciences of Philadelphia 8: 228-280. Zuykov, M.A. and Harper, D.A.T. 2007. 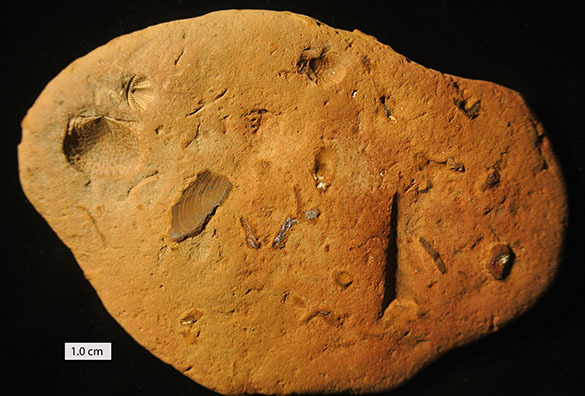 Platystrophia (Orthida) and new related Ordovician and Early Silurian brachiopod genera. Estonian Journal of Earth Sciences 56: 11-34. Last week the students of my Invertebrate Paleontology class found many excellent fossils in the Whitewater and Liberty Formations of southeastern Indiana. We will be featuring some of them in this space. 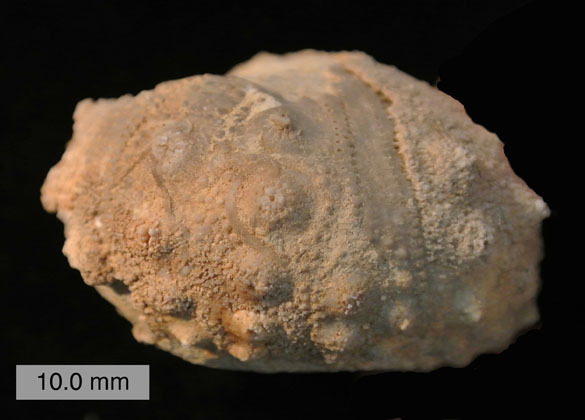 I want to start with one of my own finds: an orthid brachiopod from the Whitewater known as Vinlandostrophia acutilirata (Conrad, 1842), the inside of which is encrusted by old friends Cuffeyella arachnoidea (Hall, 1847) and Cornulites flexuosus (Hall 1847). 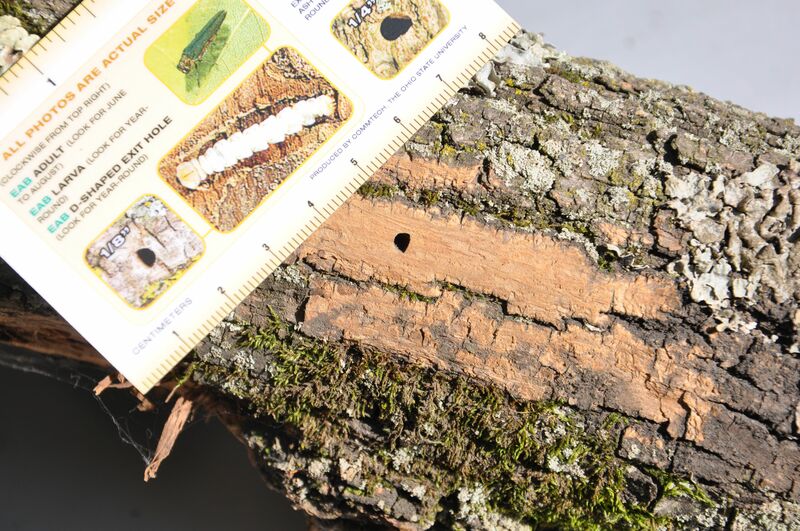 A sclerobiont is an organism living in or on a hard substrate. 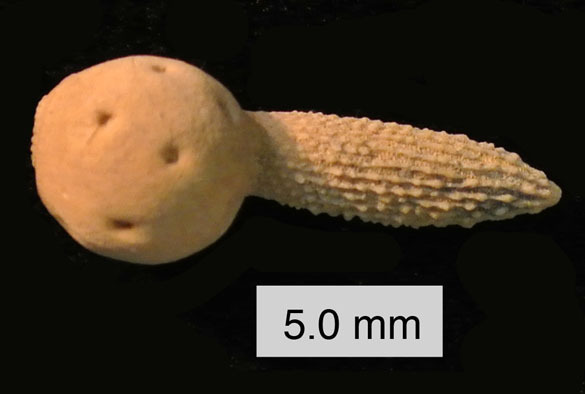 The branching form in the image is Cuffeyella arachnoidea, an encrusting cyclostome bryozoan well represented in the Cincinnatian Group (Taylor and Wilson, 1996). 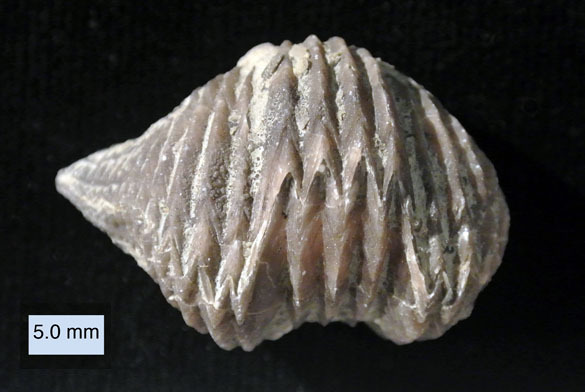 The conical encrusters are the lophophorate Cornulites flexuosus, a species we covered earlier in detail. These sclerobionts were well protected from weathering on the outcrop by the concavity of the brachiopod’s interior, giving us a beautiful vignette of an ancient ecosystem. 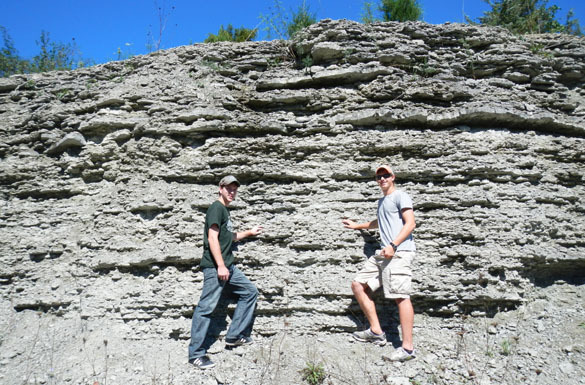 RICHMOND, INDIANA–Geology students in the Cincinnati area are a bit spoiled when it comes to finding fossils in the field. The Upper Ordovician rocks here are world-famous for the extraordinary abundance, variety and preservation of invertebrate fossils.like those shown above and below. 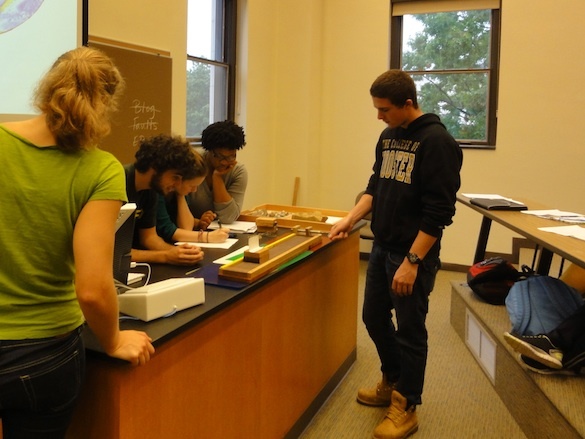 Today Wooster’s Invertebrate Paleontology class had its annual field trip to collect specimens for lab projects and analyses. 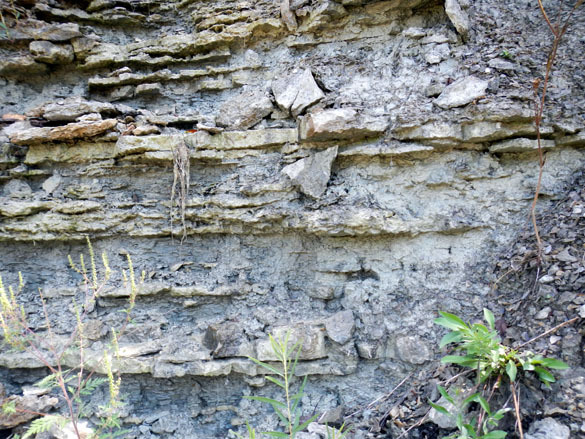 We traveled to roadcut outcrops south of Richmond, Indiana — places Wooster Geologists have been visiting for about 30 years. 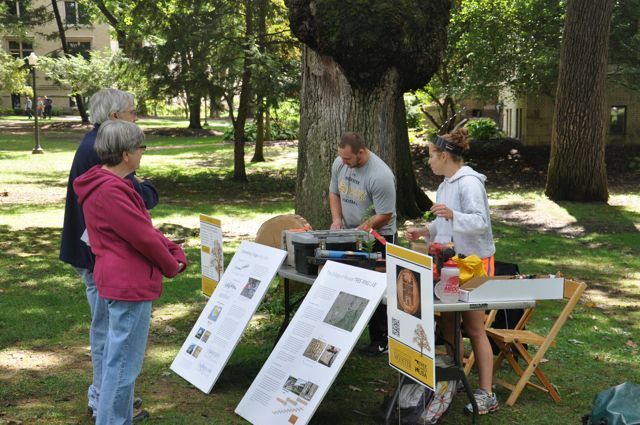 Most recently Kit Price (’13) and her team was here collecting specimens for her Independent Study project. She was on this trip as well, and the class found lots of goodies for her work. Our fleet of vehicles at our first outcrop (the Whitewater Formation). Matt Peppers (’13) and Will Cary (’13) striking a Team Utah pose with the Whitewater Formation. 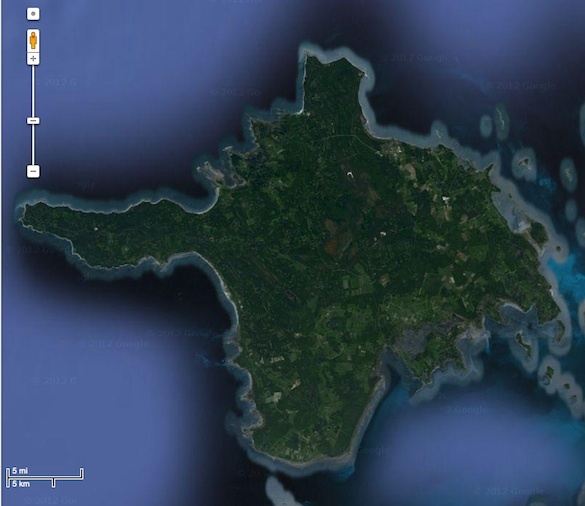 Note that this rock unit is mostly resistant limestone beds. The outcrop of the Liberty Formation at our second stop. (The Liberty is known as the Dillsboro Formation in Indiana, but we tend to use the Ohio names just across the border.) Note the prominence of less resistant shale. It was a great day — sunny, warm and full of fossils. 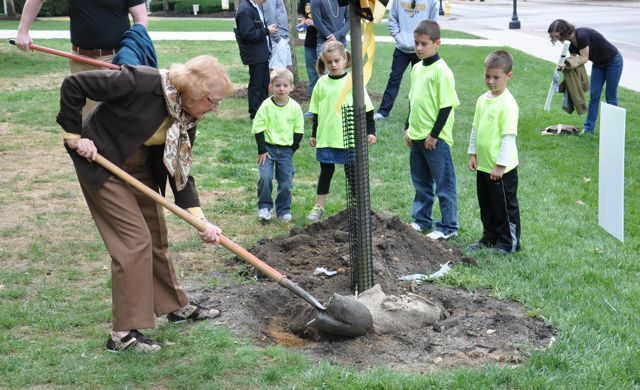 This class was especially adept at finding unusual specimens, several of which will show up us Fossils of the Week! Remember those wooden crystal models? WOOSTER, OH – I’m always awed by the beautiful and perfect symmetry of crystals. 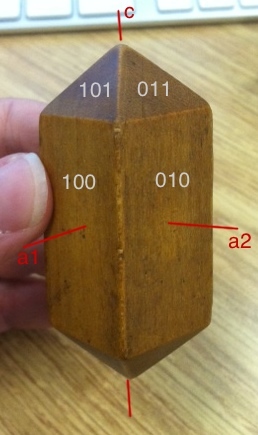 I can think of no better way to teach external symmetry than with wooden crystal models. 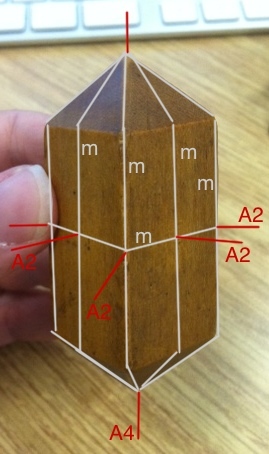 The wooden crystal models are a common experience in geology, across generations and continents, although it seems they may be on the endangered list. I’ve chosen to continue using the models in Mineralogy because they allow students to see and “feel” the symmetry operations and our structural geologist thinks the blocks help students with their spatial reasoning skills. Behold, the beautiful and mysterious crystal model. Most people develop a love-hate relationship with the models, but I have to admit I’ve always been infatuated. They’re like logic puzzles with a million different secrets all wrapped up in what seems like a simple wooden block. 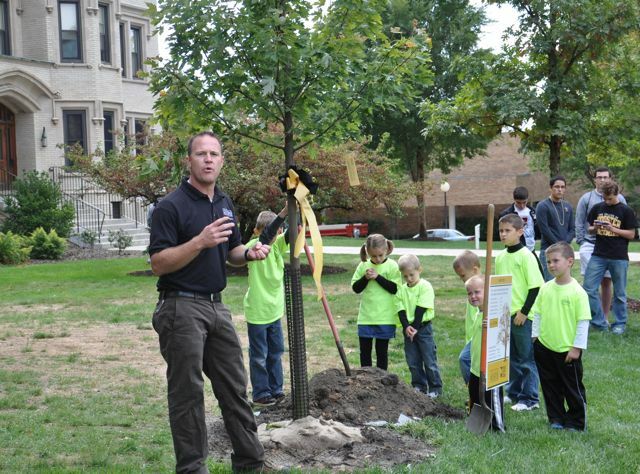 Spend some time with the block and it will reveal a wealth of information. This block has 5 mirrors, 1 four-fold rotation axis, and 4 two-fold rotation axes. This combination of symmetry elements belongs to the point group (or crystal class) 4/m 2/m 2/m. In Hermann-Mauguin notation, 4/m refers to a four-fold rotation axis perpendicular to a mirror. The second and third 2/m terms refer to two-fold rotation axes that are perpendicular to mirrors, one set of axes that exits the crystal in the middle of the faces and another set of axes that exits the crystal on the edges. The axes (a1, a2, and c) of the tetragonal crystal system align with symmetry elements. Some of the faces have been labeled with their Miller Indices. The 4/m 2/m 2/m point group belongs to the tetragonal crystal system, which has three mutually perpendicular crystallographic axes. The two horizontal axes (a1 and a2) are equal in length and coincide with the two-fold rotation axes. The vertical axis (c) is longer than the horizontal axes and coincides with the four-fold rotation axis. Once the crystallographic axes have been determined, we can describe the orientation of the crystal faces using Miller Indices. In short, Miller Indices consist of three numbers (four in the case of hexagonal crystals) that are derived from the intercepts of crystal faces. The crystal face that intersects the a1 axis but parallels the a2 and c axes is assigned a Miller Index of 100. The crystal face that never intersects a1 but cuts both a2 and c is assigned a Miller Index of 011. We could keep going with this…describing forms, measuring angles, plotting on stereonets, but we won’t. Making it through Miller Indices this week will be enough for the Mineralogy students. Here’s the big secret: this is one of crystals we’re working on in class. I guess we’ll find out which students read the blog on a regular basis!